Presented here a whimsical Folk Art Carving from Pennsylvania. These were made "Just for Pretty" and "Just for Nice". 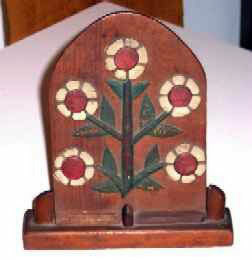 The flowers are carved and then attached to the tombstone shaped backboard. The painted surface is the absolute best! This is one of those wonderful things that was made to simply give pleasure. Didn't really serve any earthly need except to bring a smile to one's face. In those days when so much was practical, it was nice to have something that was "Just for Nice"! Size is 8" tall and 6-1/4" wide and 1-1/4 deep. The backboard tilts slightly backward from the base to give a sense of depth to the piece.